Former Nigerian President Olusegun Obasanjo, who spoke at the launch of his book, ‘My Watch,’ in London. “I am not just an armchair critic. I have been through it” said former President of Nigeria Olusegun Obasanjo in London last night. Obasanjo was Nigerian Head of State from 1976 – 79 and 1999 – 2007 and was promoting his new book, My Watch which has been banned in Nigeria. 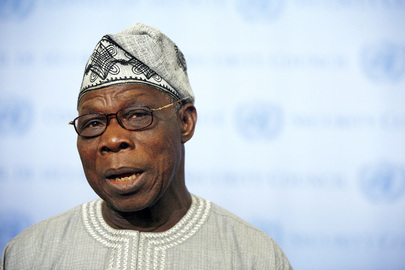 Obasanjo’s enduring influence was illustrated earlier in the week when, at a launch event in Nairobi, he made headlines by appearing to endorse opposition All Progressives Congress presidential candidate and former military ruler General Muhammadu Buhari in his bid to unseat incumbent Goodluck Jonathan, the leader of the People’s Democratic Party (PDP), in polls originally scheduled for this weekend. Obasanjo was one of the founders of the PDP. Hardly a ringing endorsement to ‘Vote Buhari’ – more a grandfatherly lesson in civic education. He did however defend the former ruler’s academic credentials, recently impugned by his opponent due to an unfortunate difficulty in locating his school leaving certificate. OBJ also refused to comment substantively on the recent postponement of the election, ducking the question somewhat by saying that “I was in Munich at the time”. But in an interview for the Financial Times earlier in the week he mused that “The signs are not auspicious…I don’t know whether a script is being played”. Obasanjo may not be an armchair critic, but the regularity and vehemence of his attacks on his presidential successors, Yar’Adua and Jonathan, suggest a desire to distance himself from the men whom he played a crucial role maneuvering into power. This followed the blocking of his own attempt to achieve an unconstitutional third term in 2007. When faced with a question from RAS Director Richard Dowden on his former Financial Crimes (corruption) Commissioner Nuhu Ribadu, who opined (in communications with the US Ambassador to Nigeria) that graft was worse under OBJ than his successor, Sani Abacha, Obasanjo, barely believably, said that he hadn’t seen this particular correspondence, despite the fact that it came to light in 2011 and made headlines in Nigeria at the time. Why are you media giving OBJ the attention he does not deserve? “A thief has no moral right to call somebody else a thief” Neither can a looter call some else a looter. If unopposed OBJ would have ruled Nigeria for an unconstitutional third term after his military dictatorship and another eight years of looting. OBJ should leave the critiquing for other Nigerians who have the moral right and cleaner records. GEJ refused a continued remote control by OBJ, so OBJ got mad, abandoned the party that made him President, condemned GEJ and endorsed the opposition! Strange bed fellows indeed -OBJ and GMB!!! It is very unfortunate that our Nigerian leaders has woven the country into the fabric of indecency and corruption. Postponement of the election is meaningless. It a strategic to manipulate figures at the detriment of the populace. Obasanjo was never a founding father of PDP. He was in prison for coup plotting when PDP was formed, he was later granted State pandon to enable him contest because the North fear give the president to anybody from the South with what they did MKO will back fire on them so they cleverly released OBJ from prison and granted him state pandon then nominated him as the next president. He is only fighting Goodluck and Yaradua because all the companies he sold to his men eg Dangote, Femi Otedola and Akinbabalola prior his expiration as a president. Firstly, Mr. editor you are abjectly wrong, colossally incorrect and fundamentally arguably not factual, either by way of error, mischief and or at an attempt to rewrite history, Obasnjo was never a founding member of the PDP, he was not there when the party was formed, as a matter of fact was serving prison terms for alleged coup plot, by being accessory to the fact, therefore couldn’t be more wrong with your assertions about Obasnjo being a foundation member of PDP. At worst he usurped it mismanaged it and left it damaged which produce the current government rightly described by him in his press release and publication of his watch where he failed to realized also being watched. Severally he single handily plotted and executed the imposition of unpopular and incompetent people to govern Nigeria. In 1979 as military head of state organized an election for change to democracy and informed Nigerians we will not have the best candidate emerge as winner to govern Nigeria and the nation’s fortune took a downward turn for worse continually resulting in the mess we are mired in today. He cannot divest absolve and neither can he pass the bulk in the current messy affairs currently obtainable in the nation space referred to as Nigeria. The world should ask Obasanjo about the essence of his crocodile tears and to serve what purpose and for what ignoble intention? I think despite his apparent shortcomings, Obasanjo has been one of the best leaders Nigeria has ever known, given it’s relatively short history. In a fragile and (not-quite-yet) budding democracy like that of Nigeria, rife as it were with corruption, everybody gets the short end of the stick when it comes to public opinion. The truth is only visible after the fact. Security was never even an issue, etc. I will be the first to say I know very little about politics or even current affairs, but I think Babangida, Abacha, Yar’Adua, and Jonathan all in combination have not done as well as Obasanjo did in his own administration. I think we can afford to give him just a little benefit of the doubt. Please Mr Obasanjo it think it is a hard time you spare you remaining energy so that you will die in peace when called. Whosoever is telling you that you will always lead behind the screen I think cheated you. It is laughable how you have turned from a demon to an angel. I don’t know where and how people gets the impression that you form or part of the formation of PDP while you where in jail for an alleged coup plot. Please I have a question for you concerning your book MY WATCH who were you watching? Are you sure you have no lost your sense of reasoning to ego? How can any right thinking Nigerian take you serious? You had a pre-knowledge of late Yar’Adua’s health conditions but had your way in making him the president. You failed to manipulate him till his death and you later turned to his vice Jonathan who lather understood your evil intentions for the wellbeing of the nation. Now you have been banned from launching your book in the country you claim not to be an armchair critic. It is unfortunate that people like you don’t know when to call it a quit and retire with some dignity. Lets see what else you will be saying after May 29th when Jona must have inaugurated for a second term in office. please save us your watch old man. I thought OBJ gave a terrible presentation at the book launch. He was evasive, brushing off questions for serious commentary on the Delta, Boko Haram and the economy with jokes or petulance. Or Nigeria’s fate is all “God’s will, amen”, which is a brilliantly pathetic excuse for any leader. Plainly, he is more obsessed with establishment rivalries than the fate of Nigeria. He will not broach criticism – underneath that joviality is an authoritarian, although thankfully he is not inclined to dictatorship (I think he genuinely believes in civilian government, whatever his failings). One of the notably points he raised was that the economy would thrive even if oil was at $50 per barrel, “if the leakage could be stopped”. Pipeline sabotage was worse under his administration than now! His reaction to every crisis is a brutal crackdown. I’m no fan of Jonathan, but he has at least created some semblance of peace and stability in the Delta even if that has meant co-opting and appeasing his militant allies. An imperfect peace, but better than Obasanjo’s rule. People seem to forget just how bad it was in the south-south before Yar’Adua and Jonathan. What would he do in the Delta and in the northeast? This proud military man has absolutely no answers! He is irrelevant. He was asked a question on this and said nothing. Yet he positions himself as the father of the nation and a military mind. The truth is that anyone who believes a change of political leadership will make a rapid difference in the northeast is lying. He said that there were a million Nigerians who could become president. I agree with him. There were many in the audience who possibly have the right qualities, but the problem is they are in an audience in London and not in Nigeria. obj is nothing but an old pig,he wanted another 5 years term if not nigerians are now wise,please obj go and have a rest till your little time on earth comes. pleas Nigerians wake up from your slumber, its time to choose a credible leader, the foundation of the past leaders is nothing to recon with in our modern world. Lets open our eyes very wide. please vote wisely. I appreciate whatever contribution/s Mr. Obansanjo has made to the development of this country. But I think what he is doing now is to put a wedge to the peaceful co-existence to the peoples of this nation. He should just go ahead and support whomever he wants but should shut up from making inciting statements about those in authority. I doubt that Obasanjo would have allowed any such attacks on his person during his tenure as the president of this country. We still remember that he it was who almost destroyed this country when he was scheming for a third term. Look at a man without conscience … Mr third term talking boldly as if he has any atom of relevance in this nation. We’re careless about your lies and deceits. Go to hell and bury your face in shame with all those naughty atrocities you committed during your fraudulent days as the president of this populous nation. You’re a born criminal and posterity will never forget all your evil deeds … You will be disgraced after March 28. Old fool! Devilish Obasanjo!! OBJ is nothing but a fool , he ruled NIGERIAN for much more than any other useless greedy presidents of Nigeria, what did he achieve for the nation Nigeria, he should go to hell and burn to ashes . He is the reason for the sufferings of every Nigerian today . Big looter , selfish and irresponsible ugly idiot. OBJ is an opportunist that deserve no attention. He was not voted in by Nigerians. The first time, he was installed by IBB and other northern retired and serving military generals to serve their bidding. The second time, he know that if the election was free to some extent, he will loose, knowing that he lost even in his community. And with power in his hand, he brazenly rigged himself back. that was the beginning of do or die politiking in this civil dispensation. After reading what verious people wrote about OBJ which I have not heard before, infact I become very, very unhappy. He was in jail when PDP was formed. It is unfortunate, as an exconvict, he supposed not to make any contribution direct or indirect to Nigeria democracy. He should leave Nigeria alone. His own curruption during the time he was president was so big. He should stop his attachs on Goodluck Jonathan. election a do or die affair. So corruption was more then than now. Nigeria which was going on during OBJ time,was exposed. What is OBJ gaining in circulating this book that shows nothing but his own incompetence. Has OBJ told the whole world how much that was spent(wasted) on the 2007 elections and other elections under his watch. He chose candidates and made election mere formality after spending huge sums. Has he told the that if find his way he would have gone for a third, fourth or even fifth tenures and would have probably be the president to date. We are giving this old man who don’t have peace with both his biological and political children too much attention. His place now should be at Otta-farm where he deposited the money for his 1979 OPPRESSION FOOL THE NATION. I am happy that our democracy is growing. This is the first time we are having a strong and formidable opposition that have really criticized and challenged the ruling party. Even if the ruling party wins (which is very likely) they now know areas to sit-up in their next administration. Our country will survive even this present political and economic situation and definitely win the war against BOKO-HARAM. ALWAYS TRYING TO BE RELEVANT. SHARIA ALL OVER NIGERIA if Buhari comes in. Obasanjo’s administration was characterized with high profile political killings like Bola Ige (late Attorney General) and Harry Marshal, one of the founding members of his ruling PDP. The best choice for the vice presidential seat during the late Yaradua’s short tenure was Donald Duke, a gentleman that all Nigerians endorsed at that time. It was Obasanjo with his egoistic and dictatorial tendency who imposed Jonathan on us to protect his selfish Oil interest in the Niger Delta. If Donald Duke had succeeded Y’aradua, Nigeria would have by now taken its appropriate position among the comity of nations. Obasanjo also knows that if Buhari actually has a health problem as being speculated, his tribesman will automatically succeed Buhari as president in case of any eventuality. Obasanjo therefore must have foreseen a threat to his oil interest in the Niger Delta if Jonathan gets a second term. Secondly, his campaign against Jonathan has an ethnic colouration. Let him go and rest and enjoy his loot with all the atrocities he committed during his tenure. His ideas are old fashioned and not acceptable to the present generation. As a member of council state, let him go there and contribute ideas if any on how to end the instigated insurgency in the north east of the country, period.